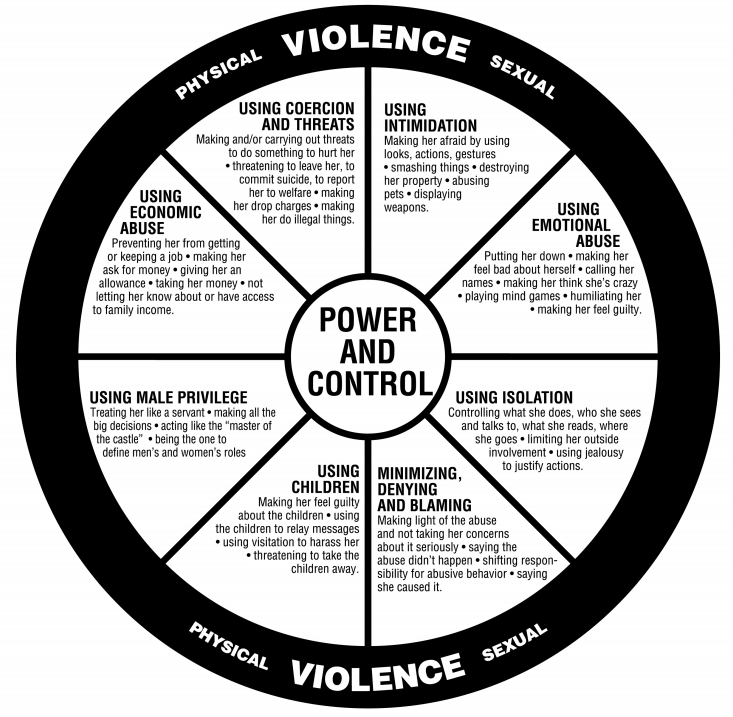 The Power and Control Wheel is a tool utilized in the domestic violence/interpersonal violence field to understand the tactics abusers use to gain power and control over their victims. The wheel is instrumental to our understanding of how abusers operate. The wheel was created by the Domestic Abuser Intervention Programs as part of “The Duluth Model”, which focuses on training and education that teaches how communities can work together to shift blame to abusers and better support survivors. To date, it is the most common batterer intervention program in the United States. Since its creation in the 1980’s, the model has been criticized for focusing on women as victims, but not perpetrators, and failing to accurately represent the motivations of some men who batter. Additionally, there are several complaints quite explicitly calling out the section of “using male privilege”, as some believe this diminishes the fact that men are abused too. These challenges are important to consider, as they point to important distinctions and research has addressed in recent years. We plan to explore the research related to these challenges in the future, as they could also be utilized to challenge a coercive control framework, but for now, we are going to focus on understanding the basics of the model, as we have found it to be incredibly useful. You can check out DAIP’s website for videos explaining each portion of the wheel. Many experts in the field have utilized the wheel to explain varying aspects of abuse, including specifics of certain cultures and groups. These adaptations build upon the wheel’s framework to provide further insight in varying contexts. We like how Dr. Clare Murphy explains the wheel, as well as the adaptation she created to explain how “wider culture breeds, reinforces and supports the male imperative; the notion that men have rights over women.” Check out her website, Speak Out Loud (a website to “Learn About Coercive Control And Psychological Abuse") for her thoughts on the wheel’s impact and a description of her adaptation. We hope that this model serves to be validating for those who have experienced this type of abuse. In the future, we also hope to make the connection for those who may have experienced this abuse in another environment, which we will continue to explore on this journey to understanding. Newer PostIn the News: Should an Abused Wife Be Charged in Her Husband’s Crime? Older PostWhy Is a Coercive Control Framework So Important?